The results of evaluation of real condition of cast iron railing of the Kotzebue Bridge and the opportunity of welding application for its restoration are presented. According to the instructions SRP 2007.4.1 on carrying out restoration works on the cultural heritage objects, an expert examination of the disassembled elements was carried out, the lists of defects were compiled and the complex of investigations on identification and weldability of cast iron was performed. It was established that the peculiarities of weldability of such cast iron are predetermined by its pearlite structure, carbon content, gas saturation, penetration of corrosion products deep into base metal, low ductility, as well as tendency to formation of cementite, ledeburite and welding stresses in HAZ metal. The principles of minimizing the influence of these factors on weldability were developed. The approach to selection of welding method and welding consumables was mastered. It was established that the mechanized method of welding using self-shielding high-nickel wire of grade PANCH-11 meets mostly the specified requirements. On its basis, the technology for restoring integrity of all the main architectural and decorative elements of railing (grates, emblems and cornices) was developed and implemented under the author’s supervision 7 Ref., 2 Tables, 7 Figures. SRP-2007.4.1. Pt 4.1: Recommendations for performance of restoration works on objects of cultural heritage — monuments of monumental sculpture. 4th ed. [in Russian]. Demchenko, Yu.V., Denisenko, A.M. (2011) Recovery of serviceability of versatile thick-wall parts from cast iron in metro equipment. Svarshchik, 3, 6–9 [in Russian]. (2005) GOST 344–87: Foundry goods with different shape of graphite. Methods of determination of structure [in Russian]. (1993) GOST 2999–75: Metals and alloys. Method of Vickers hardness measurement [in Russian]. (1987) GOST 1412–85: Spheroidal graphite iron for castings. Grades [in Russian]. 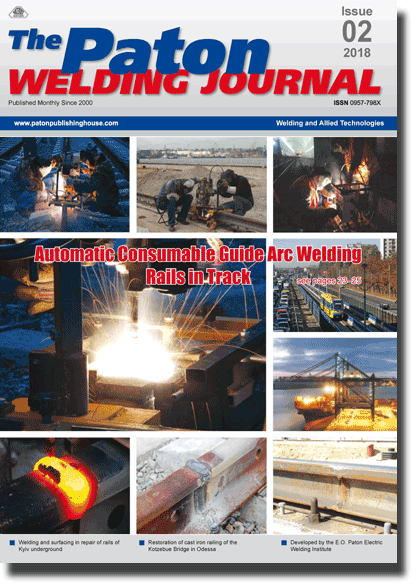 (1996) GOST 30430–96: Arc welding of structural cast irons. Requirements to technological process [in Russian]. (1987) TU 48-21-593–85: Welding wire from PANCh-11 alloy. Specifications [in Russian].